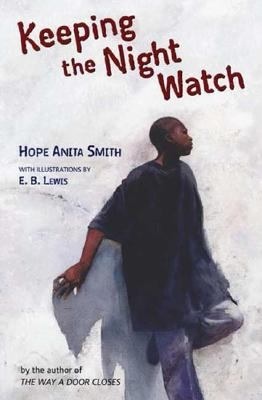 Hope Anita Smith is the author of three lovely, compelling, and highly acclaimed books for young readers: MOTHER, THE WAY A DOOR CLOSES, and her most recent, KEEPING THE NIGHT WATCH. In KEEPING THE NIGHT WATCH, “so many unanswered questions weigh down thirteen-year-old C.J. as he struggles to understand why his father walked out. His father is back now, though C.J. is not as quick to forgive as the other members of his family. He still feels the weight of responsibility that fell on his shoulders when Daddy was gone, and he’s not prepared to give that up. But C.J.’s anger is making him a stranger in his own home, and instead of life seeming better now that Daddy has returned, it feels worse. 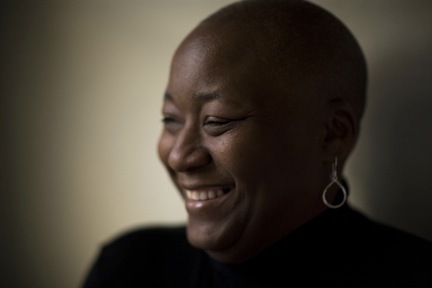 Through powerful poems, Hope Anita Smith chronicles the nuanced emotions of a family that is slowly learning to heal and put the pieces back together.” Ms. Smith didn’t want to just tell the story of a father who disappears: “I wanted this story to have a different ending, an ending that proves wrongs can be righted and it’s never too late to say ‘I’m sorry.’ ”A native of Akron, Ohio, Ms. Smith now lives in Los Angeles, California, where she is also a professional storyteller and teaches poetry writing workshops to all ages. Why do you write? What inspired particular works — an image, a conversation, a person, a situation, etc.? Can you describe some surprises along the way of a story? I have always loved words. I love the rhythm of them as they flow across a page. I was never good at playing the piano but when I picked up a pen, I knew that was an instrument I could play. I write because I have stories to share. I write because I cannot imagine my life without writing. It is my way of communicating. Sometimes an overheard conversation, a picture or even a word inspires me. The poem ‘Splinter’ in MOTHER POEMS was based on a word. The word conjured up a memory (how my grandmother took care of me when I got a splinter), which inspired the poem. There are also times when my characters surprise me with things that they say or do. I respect them enough not to impose my thoughts or opinions on them. I wait for them to tell me what they want. In KEEPING THE NIGHT WATCH, C.J’s anger and pride are so real, and so well-balanced with his deep capacity for love and desire to be the “man of the house”; the school scenes are so vivid, and all of the relationships are acutely drawn. Did you know that you would continue C.J.’s story with Keeping while you wrote The Way A Door Closes? What prompted Keeping? Do you know a C.J.? Or many? Did Keeping the Night Watch unfold the way you’d expected it to, or did any of the characters surprise you along the way? What did you want readers to know about C.J.? I did know that I would continue C.J.’s story when I was writing The Way A Door Closes. C.J.’s father comes back at the end of TWADC and I did not want anyone to think that was the end. I didn’t want readers to assume “they all lived happily ever after”. It was important to me that book two tackle C.J.’s father trying to regain his family’s trust and respect. Yes, I do know a few C.J.’s. I had no expectation when I was writing Keeping The Night Watch. I have an immense amount of respect for my characters and try to influence their stories with what I think is best. I follow their lead and they know what they want (whether I like it or not). I wanted readers to know how hurt he was by his father’s leaving. I wanted them to know that he was stubborn and afraid that he would be just like his father and would one day abandon his family. And, ultimately, I wanted them to know that he was strong enough to find his way back to his father and that he was smart enough to know that he would grow up to be his own man. What led you to the children’s writing industry? What has kept you in? Can you describe some of the high and low points? What publishing issues are important to you right now? What are the challenges? What are you excited about? Were there any people who played pivotal roles along the way? I came to the children’s writing industry by way of a teacher/author named Myra Cohn Livingston. I took a class with her and discovered my voice for writing for children. I already read children’s books. I felt that even though they were ‘children’s books’, they were really for adults. I had quite an amazing collection even before I found my way to writing for children. My collection continues to grow. A high point, for me, would be discovering a character’s name or coming up with a title for a completed poem. It is a feeling like no other. One of the low points for me is completing a book. I feel as if I am losing family members or friends. I have nurtured those characters in the story and now they are going to go off and live on the shelves of bookstores and libraries and I miss them. One aspect of publishing that is of interest to me right now is e-books. Technology is on the rise with Kindles, Nooks and iPads and I worry about books (the ones you hold in your hand) getting lost. Going the way of the dinosaur. I think there is room for both, but I don’t know if we know how to create and/or appreciate that balance. I also worry that these devices will turn children’s books into animated characters that talk and sing and dance across the screen, thus making it a movie experience, not a reading experience. What would you like to write that you haven’t written yet? Is there anything, a different genre or style, that you’d like to try? My joy comes from going into the classroom and getting students writing, helping them find their voice. I love sharing my passion for words with them and inspiring them to tell their stories. The only way to be a writer is to write. You have to get the words down on the page. Also, if you want to be a writer, you need to be a reader. What interview question would you like to be asked, and what’s your answer? What do you most want to accomplish as the Children’s Poet Laureate of the United States? I want to put poetry in the classroom with all disciplines, art, history, science, math, etc. I believe that getting our children reading and reciting poetry will improve their communication skills and getting them writing poetry will improve their writing in all other areas. You can look forward to a funny story and a tall tale. I am working on a poetry collection about dads that I will also illustrate. The new poetry collection about dads is for the very young (picture book age). It is truly a wish book. A joyous celebration of the kind of dad I wished I’d had. Thank you so much, Ms. Smith — we look forward to it! Visit Hope Anita Smith online. Keeping the Night Watch sounds like one of those books which “tells the true,” as Jane Yolen puts it. I am always glad to see books like the joyful picture book she’s working on — those great Dads – but I think we need a balance of books which help kids to cope with fathers who leave. Great interview! I love that Hope Anita Smith collects children’s books, and that she was inspired to try writing one herself. Such an inspiring interview, Anita. Thank you for writing about such a sensitive topic, and by doing so empowering young men who will be tomorrow’s leaders. Childrens books,,Hope Anita Smith ,,,,keep up the good work!!! Bravo! I love the dedication to the children in regards to poetry and reading. Sometimes it’s the only way to get them interested in reading.